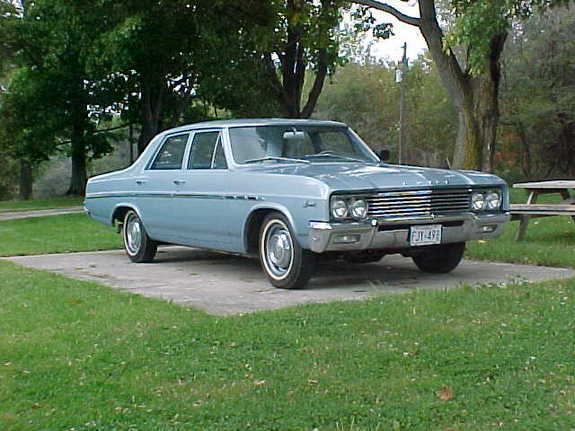 This was my first car. It's true; you never stop loving them. When I got her, she didn't look all shiny new like the advertisements you can find in old "Look" magazines; she was 22 years old, in fact, and there was no Jeannie Shrimpton type leaning on the hood in gear gear. And with six cylinders, this was a little old lady car, and it would have been Jeannie Shrimpton's mum leaning on the hood. Probably because she forgot to take her arthritis meds. This is what I saw when I opened the hood. I'm not a mechanical guy at all, but when I looked in at that, I pretty much knew what was doing what, and I could make certain adjustments and fix simple problems. 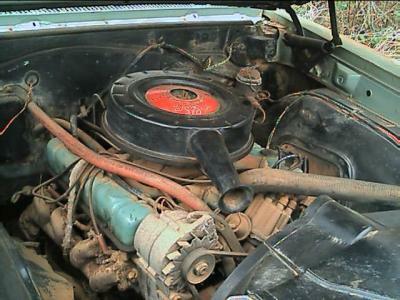 I could replace belts and hoses and plugs. Sometimes if it had trouble starting cold, I could coax it to life by propping open the choke plate on the throttle. I'd get out, look around for a suitable twig, pop the cover off, and jam the stick in the choke. Yes, I could fix the car with a twig. Like Robinson Crusoe I was. Like Gilligan. With each car I've owned since, I've watched that pool of ability shrink. Electronics and technical sophistication have been a mixed blessing. I appreciate being able to lock or unlock the entire vehicle with a click of a button on my keychain from 30 yards away in the pouring rain. On the other hand, having to turn the key in the ignition just to crack a damn window drives me nuts, in a crotchety old man kind of way. The book slammed shut on my Robinson Crusoe days when we bought a Prius a couple of years ago. I usually have two motives for every decision I make, and the decision to convince my wife we should buy this car was a perfect marriage of self-interest (gas mileage! ), eccentric grudgework (take that, Exxon; take that, Saudis! ), social consciousness (save the earth! ), and generally not thinking about any of them so hard that I thought myself out of doing it. I've opened the hood of that car once since I bought it. I had no idea what I was looking at. It doesn't even look like an engine to me, though I detected parts of an engine in there, mixed in with other things; as though space aliens found a car engine and a Sony Playstation and a dehumidifier all in pieces in a junkyard and mistakenly tried to assemble them into one piece of machinery. It's covered with "do not touch!" warnings and black-and-yellow graphics of stick figures getting zapped that seem more pertinent to nuclear reactors or the tags on new mattresses. Well, last week something went wrong and the Prius started misbehaving. I didn't even consider twigs; I just called the dealership and told them to come get it. Which is another thing I hate. Back in the day, part of your manly skill was finding a good independent grease monkey and cultivating a relationship with him, for those times when twigs alone were not enough. You never, ever took a car to the dealer to be fixed; you'd get charged too much and they'd find something else that "needed" to be fixed. Nowadays, forget the grease monkey. The technology is so complex that the manufacturers can effectively block any independent mechanic from fixing it. So the dealer has my car, and it will take two weeks to put a new computer in it and get it checked out. A car that can't run without a computer! In the meantime, after I bitched out the service manager, they agreed to underwrite a rental. They probably thought they were putting me in my place, because the rental is a very basic Ford product, a Probe or a Focus or something. It's got zero frills, an actual old-style turn signal that clicks on and off, and -- saints be praised -- you roll down the windows by hand, with a crank. It will be a sad day when Fisher Price stops making these. They have been around at least as long as I have. It seemed like there was one in every house with toddlers in the neighborhood where I grew up. My son had one when he was little 15 years ago or so (with a plastic base in place of the wooden one on the older toys). Recently we pulled it down from the attic and cleaned it off for my daughter to play with. Rotary dials? Cradle-style receivers? The scratchy "chatter" sound? My child will grow up in a world where nothing resembles this toy. She may never see the thing this is based on. But it's such a happy toy, with its googly eyes and button nose and perpetual smile. It's going to be sad to see it go. You can't put a cell phone on wheels. When I remember my grandmother's kitchen, I still see the old refrigerator: rounded like a cream-colored cast-iron bank-safe, deep and delicious. From, what? The twenties? I sometimes forget they didn't have it till the end. It died, eventually, and they made a big production of a trip to Sears on a Saturday night to buy a new one. Probably only because the son of the man who sold them the original fridge worked there, as a department manager, but he had only the faintest idea who these three old ladies were. The new one was sharp, chrome and plastic, but solid, expensive, and modern. It was not the old one, no, not at all. When that old reliable appliance died, it was a sign that things could live too long, and soon two sisters died and the third went into the home just when I was buying my first house, which is how the new refrigerator came to me. That memory returns sixteen years later. I'm looking at the refrigerator in its naked and rusty age. Stripped of magnets and clippings, but stained with their outlines. Tomorrow the delivery crew will wheel the new fridge in, and cart the old one out. You can live for years with a thing and not see the thing, but I guess that's easy when it's papered over with gew-gaws and art projects and souvenier post cards. Today, there's nothing to see but the appliance, and its surface still holds enough shine to show back a faint ghost of myself. Unloved in both its homes: In the first because it was new, in the second because it was old. I'll have to unhinge the kitchen door to fit it out, as we had to do when we moved into this house. That was with my first wife and a gang of friends I don't have anymore. 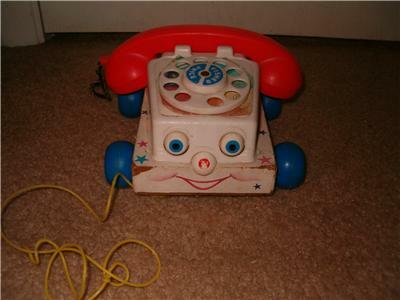 Do you remember the telephone numbers of your childhood? Probably, because in those days that was one of the bits of information branded into your brain by parents in case you got lost. The stamp of it is probably still there, like the date on a worn silver quarter. Most of mine began with two letters. Out in Chester County when I was little, sometimes we said "696-" but most people knew it was really "OW6-" and that stood for "Owen 6." When we moved to the Main Line, everyone used them: Ours began "MI9-" for "MIdway 9." My girlfriend's was "MOhawk 7." They're gone now, and a lot of the old America of the mid-20th century is gone with them. Like pumping your own gas and three-network television and savings accounts. Already they were archaic when I learned them; the automatic dialing system was operating everywhere I lived. Today, kids probably think the phone buttons have letters on them just so advertisers can work the company name into the phone number. But the original notion was to use words that could be easily and distinctly pronounced to an operator. One of my favorite uses of Internet technology is to build shrines to earlier technologies, and sure enough the exchange names have a memorial page. 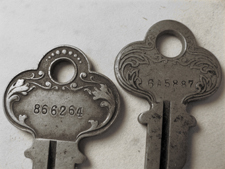 Telephone numbers used to begin with two letters, which were an abbreviation for a word. For example, there was a Glenn Miller song called PEnnsylvania 6-5000, and Liz Taylor made a movie called BUtterfield-8. I'm just barely old enough to remember that my phone number at home when I was 5 or so started with SYcamore 4, or SY4. These were telephone exchanges, and had exchange names -- PEnnsylvania, SYcamore, KLondike, etc. But the surprising thing is, there doesn't seem to be a surviving master list of them. Undaunted, the Web site and its fans set out to compile their own, based on partial lists from the 1950s and recollections of older readers. Check the database and see if yours are on it. Not content with merely memorializing the custom, however, they are encouraging a revival. "If someone asks for your phone number ... tell them 'MUrray 5-3247' " You can incorporate it into your phone message: "You've reached KLondike 5-3247 ..." or put it on your "business cards, advertisements, invitations, web pages" for that perfect retro look. Yesterday, when I got change back after paying for a Hunan chicken at the corner Chinese place, the cashier put a wheat-leaf penny in my hand with the other coins. I might not have noticed if she had given it to me heads-up, it was so clean and bright, like a new-minted coin. But there it was, from 1957, looking like it had fallen down someone's sofa cushions and hidden there unused since three years before I was born. Coins fascinated me when I was a child. I studied the old U.S. designs, and foreign coins (the French had the most beautiful money, the British had the most important). And I horded wheat pennies when they came my way. But I can't tell you how long it's been since I got one in change. Two years? When I first became aware of money, in the late 1960s, they were common. I still have a big jar full of them that I saved. Slowly their numbers diminished and all but vanished. Silver coin still lived then, too: dimes from 1964 rang differently on a countertop than the cheap alloy ones that came later. My grandparents, when they moved to southern Florida in 1962, still would get Indian head pennies in change at the local grocery. Something about the look of this design takes me back much further than 1909 (when it replaced the Indian head cent). 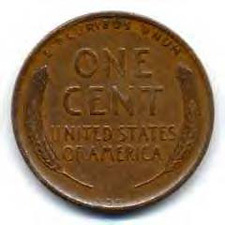 The dominant element is the big "one cent," as if it had to be made very clear to people what this was, what it signified. In that, it's like the earliest American money. And there's a point to it. Nickles issued in 1883 had a new design with a prominent Roman numeral V but no "cents," and sharpers brass-plated them and passed them off in rural regions as 5-dollar gold coins. The government fixed that the next year. The old penny is clean and Roman in its design, it seems to me. The silly architecture of the Lincoln memorial is appropriate to a commemorative coin, not to a working money; it's like those ungodly state commemorative quarters. But I turn 44 today, and maybe I'm just getting old. � 2004 Douglas Harper Moe: "Say, what's a good word for scrutiny?" Shemp: "uh ... SCRUTINY!"